Feed a high quality diet designed for puppies. A wide variety of diets and formulations are available and your veterinarian should be your primary source of information as to the best choice for your puppy. The amount fed will vary with the type of food and the individual dog, but in general, should only be as much as the puppy can consume in 5 to 10 minutes at a given meal. Puppies are usually fed 3 times daily when between 6 and 12 weeks old, 2 times daily when 12 weeks to 6 months old, and may be fed 1 or 2 times daily when older than 6 months. For certain large breeds of dogs, your veterinarian may recommend that several smaller meals be fed rather than 1 large meal (even when your dog becomes an adult) because an association has been suggested between the consumption of large meals and a serious medical condition called gastric dilatation/volvulus or "bloat." Feed a high quality diet designed for kittens. 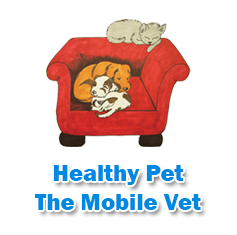 Your veterinarian is your best source for information regarding an appropriate diet for your kitten. Dry foods are usually most economical and have the advantage of providing a rough surface that will help reduce plaque and tartar buildup on your kitten's teeth, but canned foods can be fed/supplemented if desired. Amount fed will depend on the diet, as well as the age, size, and activity level of your kitten. 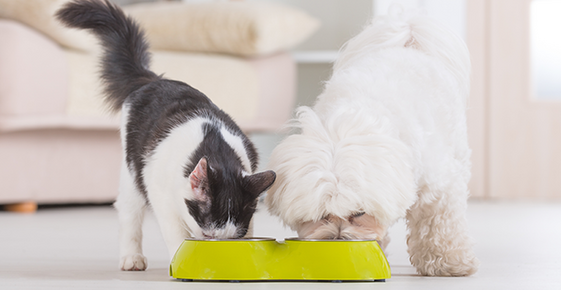 Kittens can be fed free-choice or at set mealtimes; however, many veterinarians recommend feeding all pets at set mealtimes because intake can be more easily monitored. Canned foods should always be fed at set times, because if left unrefrigerated, they can spoil. I recommend use of stainless steel bowls because plastic and ceramic bowls can scratch, leaving crevices for bacteria to hide. The latter types of bowls (and resultant resident bacteria) have been associated with feline "acne" and skin irritation. Dry foods are usually most economical and have the advantage of providing a rough surface that will help reduce plaque and tartar buildup on your kitten's teeth.